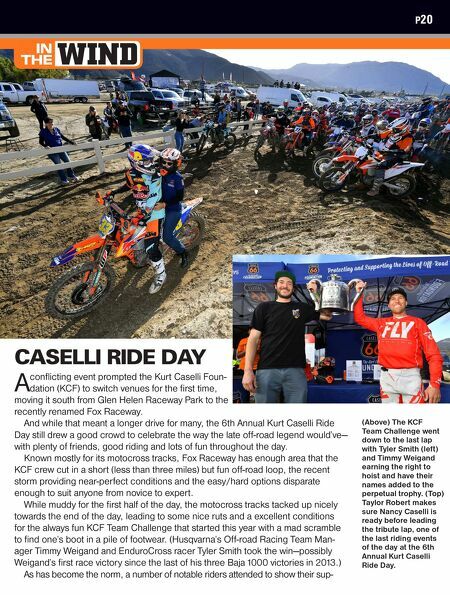 CASELLI RIDE DAY A conflicting event prompted the Kurt Caselli Foun- dation (KCF) to switch venues for the first time, moving it south from Glen Helen Raceway Park to the recently renamed Fox Raceway. 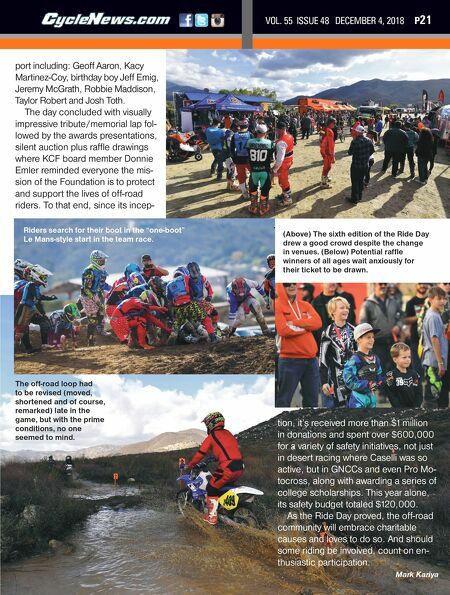 And while that meant a longer drive for many, the 6th Annual Kurt Caselli Ride Day still drew a good crowd to celebrate the way the late off-road legend would've— with plenty of friends, good riding and lots of fun throughout the day. Known mostly for its motocross tracks, Fox Raceway has enough area that the KCF crew cut in a short (less than three miles) but fun off-road loop, the recent storm providing near-perfect conditions and the easy/hard options disparate enough to suit anyone from novice to expert. While muddy for the first half of the day, the motocross tracks tacked up nicely towards the end of the day, leading to some nice ruts and a excellent conditions for the always fun KCF Team Challenge that started this year with a mad scramble to find one's boot in a pile of footwear. (Husqvarna's Off-road Racing Team Man- ager Timmy Weigand and EnduroCross racer Tyler Smith took the win—possibly Weigand's first race victory since the last of his three Baja 1000 victories in 2013.) As has become the norm, a number of notable riders attended to show their sup- IN THE WIND P20 (Above) The KCF Team Challenge went down to the last lap with Tyler Smith (left) and Timmy Weigand earning the right to hoist and have their names added to the perpetual trophy. (Top) Taylor Robert makes sure Nancy Caselli is ready before leading the tribute lap, one of the last riding events of the day at the 6th Annual Kurt Caselli Ride Day.